We’ve made our way into the new year, and Kalamazoo Country Club is here to help your business figure out the next best step by providing a quality corporate venue. From meetings to meals, presentations to pouring a toast, Kalamazoo Country Club is the perfect corporate venue to discuss what the New Year has in store for your business plan. Our corporate venue spaces are the perfect location for a presentation about what your business has in store for the new year. The spaces are designed to seat a large group comfortably, and presentation-ready. Capable of arranging seating around where and what you’re presenting, you can deliver your address to your staff and ensure that everyone has a good viewpoint to stay engaged and is comfortable while receiving your information. We know that corporate meetings can sometimes be a slow start to someone’s day, and that’s why here at Kalamazoo Country Club, we provide our guest with fresh coffee and tea to make it through the day. Even the most engaged speakers and workers can hit that early morning wall of tiredness, and we like to provide the resources necessary to keep everyone going strong through the whole day. Whether it’s in the middle of your day of presentations, or at the end, you can incentivize your employees to come to your corporate event by offering to provide them a meal from our professional chefs. The chefs at Kalamazoo Country Club have years and years of experience and a record of making delicious dishes for all. Nothing quite brings people together like food, and with the professionally-made dishes at Kalamazoo Country Club, your staff will stay focused knowing the meal to come. 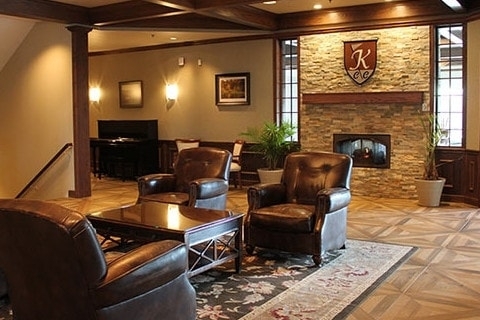 Kalamazoo Country Club is the ideal corporate venue for all meetings, business retreats, charity fundraisers, and more. No matter what business you need to discuss, you can do it from the comfort of Kalamazoo Country Club.